Truth be known, we are still obsessed with kale these days and find ourselves throwing together raw kale salads at every turn. It’s nice knowing that this versatile foil for flavor is jammed with fiber and antioxidants. This salty, tart, and tangy rendition comes alive with dried fruit and an alluring balance of flavors. Whisk together Bragg liquid aminos, lemon juice, olive oil, and maple syrup in a medium bowl. Add the mango, onions, and goji berries and let marinate while preparing the other ingredients, at least 15 minutes, but the longer the better. Add the kale and the hemp seeds. Mix the salad by hand, massaging the vinaigrette into the kale. The acid in the vinaigrette helps to break down the fibrous kale, making it tender and enhancing its flavor. This salad can be served immediately, but we think it is best refrigerated for a couple hours. It’s even delicious served the next day (and GREAT for breakfast)! 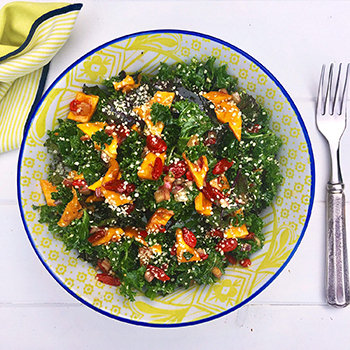 Nobody likes a salad that is over-dressed or under-dressed, so add the last few cups of kale sparingly. You may need it, you may not. Everybody measures differently and all lemons have different acidity levels. Taste and add more kale or more lemon juice or more olive oil. You should have a nice balance of salty, sweet, and sour.